Yesterday I picked up an interesting book at a Christian bookstore in Buffalo, NY. 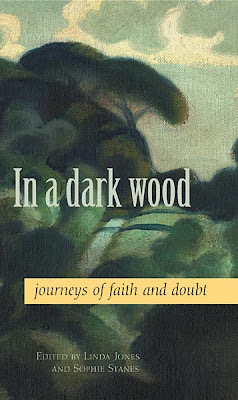 In a Dark Wood is a collection of prose and poetry by a wide spectrum of authors from various traditions. Each one has experienced a time of doubt or unbelief during their pilgrimage toward God (or away from Him). Some of the stories are disheartening! One thing is true of all of them! They are brutally honest! For one who doesn't doubt God but has a number of unanswered questions, I found this book a challenging read. Be encouraged, friends, wherever you may be on your journey! The Father knows where you are and is leading the way! Dear David...This looks like a good book but even better are your words,"Be encourgaged friends, wherever you may be on your journey! The Father knows where you are and is leading the way." Yes He IS leading the way David and He is walking beside you at the same time, and He is looking down at you, and listening to your every cry! Have a good and godly day! You know, I always like your book reviews, because now when I see a title in the recycling bin I know how much it's worth. Maybe when you make it here in the fall, if you have time to sort through a few boxes in search of treasure, Ill tell you my secret-- where I fin really good books for free. It's not a sure catch, though, sometimes there's only boxes of novels--garbage!